Is the British government going to ignore the will of their citizens and not leave the EU? The EU’s immigration policies are sparking political backlash and citizens are taking to the streets. In January, Bloomberg reported, “Mario Draghi Sounds Economic Alarm for the Euro-Area”, citing persistence of geopolitical uncertainties. It’s time to turn to the international member of our panel of experts, Rob Vrijhof, managing partner of Weber Hartmann Vrijhof & Partners Ltd., Swiss international asset managers, for a worldwide perspective. DENNIS: Rob, thank you for taking your time to help educate our readers. It’s impossible to look at the investment markets without factoring in the worldwide political environment. Before we get into investment details, can you bring us up to date on what’s happening in Europe and the investment implications? ROB: Dennis, thank you for the opportunity to talk to your readers. There are some dark clouds hanging over Europe’s head. Especially the never-ending Brexit issue. Great Britain and the European Union (EU) are still far apart after two years of discussions. We expect an extension of the March 29th deadline. Hard Brexit, soft Brexit or even a new referendum? Only time will tell. The yellow vests protesting in France continue, despite President Macron giving in to some of their requests. The immense victory of President Macron is certainly fading away. Today, there is no end of these protests in sight. The European Central Bank (ECB) isn’t helping either. Mr. Draghi is still saying Europe will not fall into a recession. He feels no pressure to start a cycle of rising interest rates. This will eventually cause problems for Europe. We believe that the US economy will fall into a recession; probably during the second half of 2020; and will be followed by Europe. While the Fed has some wiggle room to lower interest rates, the ECB doesn’t. We will be monitoring these developments very carefully. Address “unsustainable debt”, but make it easy for politicians to borrow more? At the end of fiscal year 2018, US gross federal debt was 107.1% of GDP. Trading Economics forecasts the EU to come in around 86% of GDP. When you look at individual countries, Greece (178.6), Italy (132.1) and Portugal (125.7) are leading the pack. France (97.0), the UK (85.3) and Germany (63.9) look pretty good. Rob, are Europeans tired of bailing out the heavily indebted countries? I commend the Swiss people for having the foresight to stay independent. When does debt become unsustainable? The EU is punishing the UK for trying to leave. Do you see them letting other members exit? If the top three debtor nations left the EU, wouldn’t it be a positive sign for the Euro? What do you see on the horizon? 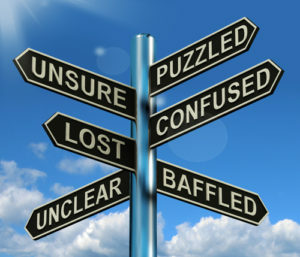 ROB: I agree, uncertainty is the enemy of business. Debt, be that private or governments, is an immense problem. Eventually, someone will have to pick up the check or get stuck with huge losses. While private debt can become unsustainable, I wonder about government debt. Twenty years ago, we would be firmly convinced that today’s debt levels were not only unsustainable, that a collapse would have happened long before now. Many of us who own gold anticipated high inflation coming soon. Greece is at a level of 178.6, which seems impossible to work out from under; yet the past two government bond issues were oversubscribed; they sold like hot cakes. As long as there are lenders willing to take a risk, things will continue. Common sense says eventually lenders stop lending and high inflation will occur. A lot of pundits have been wrong in their predictions about the timing. I find it impossible to forecast when this will happen. Switzerland, not being part of the EU, has stable growth numbers and much lower unemployment levels than most European countries. I don’t expect the Swiss will join the EU. Our independence and the Swiss Franc will be here for many years to come. While the EU is making Brexit very difficult; the Brits have not handled the Brexit in a positive fashion either. The political class doing the negotiations are not in favor of Brexit, despite the will of the voters. I doubt any other EU members are contemplating leaving after watching how Brexit was handled. Please elaborate on this. I’m asking about both the short term and long term. ROB: The volatility we have been seeing during the past few months, in stock markets, precious metal, and currencies is immense; a level I have not seen during my three decades as a senior investment advisor. We believe that this never-ending bull market in stocks will come to a stop, and would not be surprised to see a correction of 10% to 15% during the course of 2019. After a rocket start, we are currently seeing markets trading down. With economic numbers coming in slightly weaker than anticipated, and expectations of lower corporate profits across the board, we could be in the early stages of the anticipated correction. We are currently underweight in stocks and watching economic developments closely. We do have certain stocks on our watch list, mainly defensive stocks with high yields. Nevertheless, we are still holding a substantial amount of cash, mainly in Swiss Francs. Despite the current strength of the US Dollar, we feel it is getting near the top. We expect a weaker dollar in the years to come. Since we are talking about volatility, the same is true for gold. After a strong start, with levels close to the important $1350/oz. level, gold has been trading down. We need to hold levels above $1280, or it’s likely to drop back to $1250. On the upside, $1300-$1320 would signal safe waters and should lead to much higher prices. DENNIS: What you describe is the proverbial catch-22. Investors know they are on thin ice. They want to participate in an up market, but are wary of a sudden downturn. What are you advising? ROB: Indeed, we are on thin ice. The bull market lasted longer than any other bull market in history. While we are underweight in stocks, we still hold very selective stock positions in markets around the world. 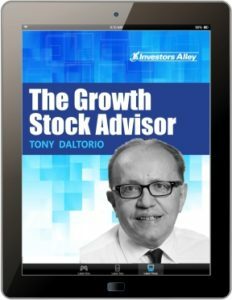 We are closely following stocks on our watch list and, when the correction comes, we are prepared to invest at that time. Investors should be prepared for the event when it finally arrives. Holding cash during this period of uncertainty is good advice. You want fundamentally strong currencies, even if the interest rates are a bit lower. Even more important during these volatile times is having your trailing stop losses in place. Although we are underweight in stocks and feel our holdings are strong, we are well aware that many investors were caught on the wrong foot during December 2018. We want to avoid any possibility of catastrophic losses. Taking some money off the table with a decent gain during these times is good, prudent advice. Look forward to new opportunities and keep your trailing stop losses in place. These markets are driven by liquidity and will in the not too distant future trade down. How far down and how long this looming bear market will last is impossible to say. Just be ready! DENNIS: I agree, holding cash in reserve is a good thing in an uncertain market. This is where your international pedigree really helps as interest rates are all over the map. What currencies do you recommend to your clients? ROB: As conservative investment advisors we look for currencies that we feel could rise versus the US Dollar. One of our favorite currencies during the past 30 years has been the Swiss Franc, and still is. We have also been investing in a variety of other currencies. Dennis, as one of our valued clients, you know we invested in Russian Rubles with interest rates of well above 8%. We have held commodity currencies such as the Australian Dollar, the New Zealand Dollar as well as the Canadian Dollar. We are currently giving the Chines Yuan a very close look and do believe that the Euro will start to show some strength during the second half of 2019.
International currencies add a fourth dimension into your investments. With our strong belief the US dollar will weaken, currency diversification gives investors another layer of wealth protection. We strongly believe that Americans should have a part of their total wealth invested outside of the USA in foreign bonds, stocks and currencies. DENNIS: Rob, on behalf of our readers, thank you for your time. NOTE: I have no financial arrangement with Rob and his firm, other than being a client. I do not endorse or recommend any financial advisors to our readers. Why? Every investor has specific, unique needs. When it comes to investment advisors, there is no “one size fits all”. Dennis here. The British government recently voted to stay in the EU, until they have a deal. What incentive does that give the EU to bargain in good faith? I’m with Rob, I feel uncertainty is going to be prolonged until after the 2020 election. Take profits and keep your stop losses in place. I want to say “Thank You” to all our readers who make their Amazon purchases through this LINK on our website. While your prices remain the same, their small stipend helps us offset some of our costs. It helps, thank you. I appreciated the feedback regarding last weeks article about socialism. I am not a fan of government, regardless of political party. Government intervention in a free market generally makes things worse. Ready for some baseball? The season opens on March 28th. The Cubs first home game is April 8th. 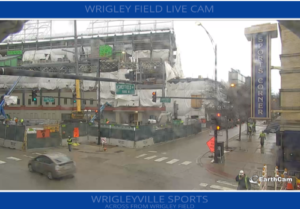 They are doing renovations to Wrigley Field during the offseason. I’ve followed the progress by watching a live webcam. They have been working seven days a week throughout most of the winter. I took this screenshot on 3/15. This is the outside view at the right field corner. It still looks like a construction site to me, although they are now down to two cranes. It will be interesting to see what it looks like on opening day. What if the dog only brings back the ball because he thinks I like throwing it? Should you throw out poison if it is past the expiration date? Do twins ever realize one of them is unplanned? The word “swims” upside down is still “swims”. If you rip a hole in a net, there are actually fewer holes than when you started. One of our favorite currencies during the past 30 years has been the Swiss Franc and still is. We have also been investing in a variety of other currencies. Dennis, as one of our valued clients, you know we invested in Russian Rubles with interest rates of well above 8%. You ask a good question. Thanks for taking the time, I’m sure others have similar concerns. should offer Exchange Traded Funds (ETF) that specialize in individual currencies. Or, we frequently interview Chuck Butler who worked for Everbank. they sell FDIC insured CDs denominated in foreign currency. They have been bought out and here is their new website, https://www.tiaabank.com/ Contact old friend Chris Gaffney, he should be able to help you. I have done all three over the years and they are fine. You should expect the currency to rise and fall with the markets. The real key is understanding you are betting against the dollar.